CHIMP successfully drove and exited a car, one of the eight tasks it performed. CHIMP, a four-limbed robot designed and built by Carnegie Mellon University’s Tartan Rescue Team, finished third and won $500,000 Saturday (June 6) at the DARPA Robotics Challenge (DRC), a two-day event that pitted 24 of the world’s most advanced robots against each other in a test of their ability to respond to disasters. During its best run on Friday, the robot engaged the enthusiastic audience as it overcame several mishaps and missteps to complete all eight of the possible tasks in 55 minutes, 15 seconds — good enough to put the team in first place on the first day of competition. But that time was surpassed on Saturday, when the winning team from KAIST in South Korea recorded a winning time of 44 minutes, 28 seconds on the eight tasks. The second-place finisher, Team IHMC Robotics from the Institute of Human and Machine Cognition in Pensacola, Fla., completed eight tasks in 50 minutes, 26 seconds. The top prize was $2 million. Carnegie Mellon also participated on a second team, Team WPI-CMU, with Worcester Polytechnic Institute. That team’s robot, Warner, finished in 7th place, completing seven tasks in just over 56 minutes. 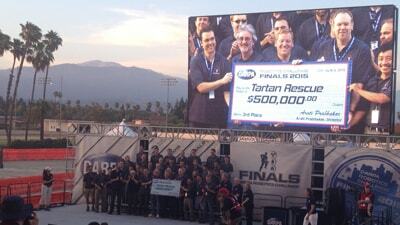 The Tartan Rescue Team received $500,000 during the awards ceremony. 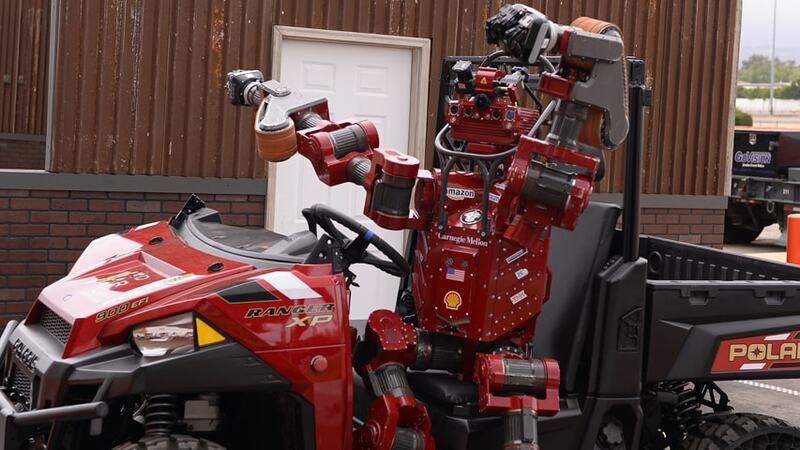 The Defense Advanced Research Projects Agency (DARPA) sponsored the event to spur development of robots capable of responding to manmade and natural disasters, such as the Fukushima nuclear power plant crisis of 2011. The robots were to perform human-like activities in environments too dangerous for humans. The robots were given an hour to complete eight tasks on courses assembled in front of the grandstands at the Fairplex in Pomona. The robots were given two attempts, one on Friday and one on Saturday. Scoring was based on the number of tasks completed, with elapsed time the deciding factor for ties. CHIMP’s first run on Friday was remarkable both because it placed the robot in first place following the first day of competition and because the team was able to recover from several significant setbacks. Those included an improbable fall that sent the usually stable robot sprawling during a door-opening task. The crowd roared as CHIMP regained its feet — the only robot of the many that fell during the competition that was able to get back on its feet unassisted. Despite the fall and other setbacks, CHIMP completed all eight tasks — driving and exiting a car, opening a door, closing a valve, using a power tool to cut a hole in a wall, clearing debris, turning off a switch and climbing stairs during its allotted time. In its second run on Saturday, the robot avoided any major missteps, but failed to complete several tasks before time ran out. CHIMP, the CMU Highly Intelligent Mobile Platform, was designed and built for the competition by the National Robotics Engineering Center, which is part of CMU’s Robotics Institute. Many DRC competitors, including the two top winners, were humanoid, walking robots. But NREC designed CHIMP to be statically stable and to roll on tank-like treads on each of its limbs, minimizing the risk of falls. The robot is roughly the size of a human, an inch short of 5 feet when it’s standing and almost 3 feet when it’s crawling. It weighs 443 pounds. CHIMP’s arms are 4.3 feet long — long enough to reach the ground, which is useful and gives the robot a simian-like stance. It can operate for 90 minutes or more with its battery pack. It can move on all fours or can stand upright. About 60 people contributed to the Tartan Rescue Team, though about a dozen worked on the project full-time. The team has a number of sponsors, including Amazon, Foxconn and Carnegie Robotics. See the complete list of sponsors. The NREC performs advanced research and prototype development for a variety of government and industrial clients. The Tartan Rescue team was presented with a third-place prize of $500,000. Despite the fall and other setbacks, CHIMP completed all eight tasks — driving and exiting a car, opening a door, closing a valve, using a power tool to cut a hole in a wall, clearing debris, turning off a switch and climbing stairs during its allotted time. In its second run on Saturday, the robot avoided any major missteps, but failed to complete several tasks before time ran out. About 60 people contributed to the Tartan Rescue Team, though about a dozen worked on the project full-time. The team has a number of sponsors, including Amazon, Foxconn and Carnegie Robotics. See the complete list of sponsors and other information about the team.